VOERE X3 – "Danilo Amelotti"
The global war against terrorism and new security threats in the early 21st century among many other effects on weaponry has resulted in the search for modern Sniper Rifle Systems. Until three years ago, Sniper Rifles Systems were considered unique very accurate weapons with specific caliber, optics, and chambers. 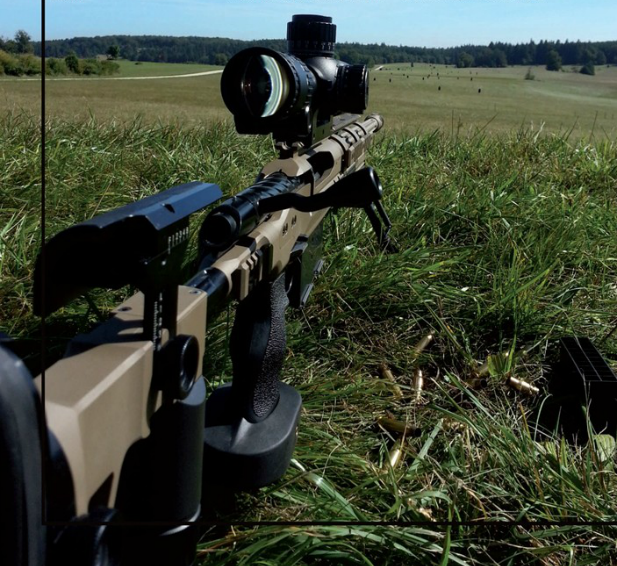 There was demand for a new concept of sniper rifles due to the global economy recession and the evolution of the modern Sniper battlefield, and therefore the multi-caliber sniper system was created. In contrast to the original Sniper System, the Multi-caliber maintains the same chassis, only requiring the operator to switch the barrel, bolt and magazine in order to switch between the various calibers. Therefore, this new Sniper System maximizes the Sniper’s potential while minimizing space and weight to the operators’ advantage, and consequently the overall cost. The pioneers of this new concept were SAKO, REMINGTON and ACCURACY. 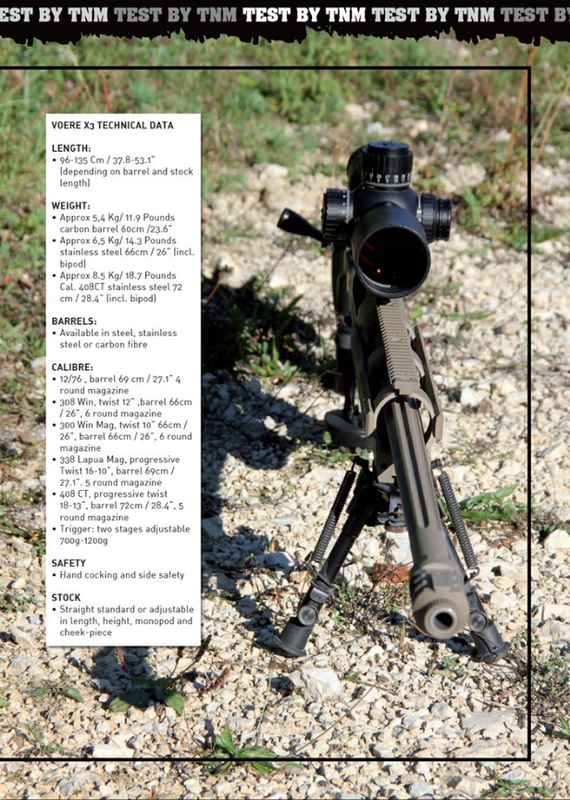 Following a specific SOCOM requirement, these companies developed their own Multi Caliber Sniper System (a short description of SAKO TRG M10 is in our issue #8). In accordance with the standard required by SOCOM, they built their Sniper System with a 308, 300 and 338 Caliber. 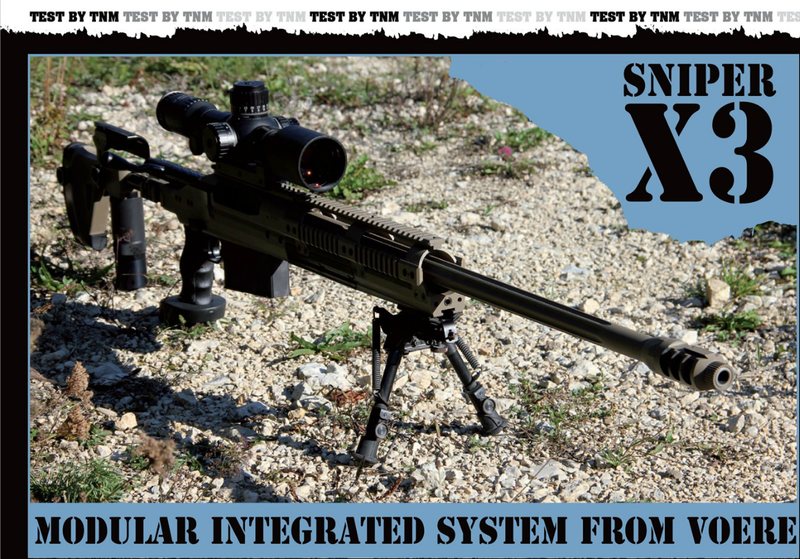 Last month I had the opportunity to test a new addition to this Multi-caliber Sniper System, the VOERE Sniper X3 Modular Integrated System (hereinafter referred to as X3). In contrast to the previous companies, VOERE decided to implement a new caliber, the 408 CheyTac. The VOERE X3 is a rifle mounted on aluminum/steel, which has a small polyurethane component between its magazine and the UIT rail that improves weapon handling when operating in cold environments. As mentioned before it has a switching barrel system that allows the Sniper/operator to switch between several caliber choices: 308, 300, 338, 408 and even Shot Gun (12/76). The rifle system is equipped with several rails positioned all around the barrel (Weaver Rails) at the base with a well-designed Bipod (UIT Rail) and for its scope (VOERE Picatinny mount MIL STD 1913 0-60 MOA). The VOERE X3 is equipped with a standard stock, a changeable grip AR15 standard mounting with an adjustable palm rest, and a fully adjustable bipod. With regard to the shooting mechanisms, VOERE X3 is equipped with an adjustable two-stage trigger (700g-1200g), a very useful hand cocking/bolt Lock and an ambidextrous safety switch. The magazine is also equipped with a jet funnel that aids in the load/reload operation and an ambidextrous magazine catch positioned in front of the trigger. The VOERE X3 has a wide range of accessories, such as the folding and full adjustable stock, back up sight, silencer, adaptor for NVD, interface, iPhone mount in addition to others. Selecting a Sniper Rifle System is always a challenge for any shooter. In fact, although the modern firearms companies are creating great weapons that only seem to differ from one another in small details, each sniper (who are basically always looking at details) spends time testing various weapons before finding the one to best satisfy his needs. For this reason I cannot really say that VOERE X3 is very different from other competitors, but based on certain details, I can confirm that this Sniper system has made a difference in the modern market for the following reasons: in contrast to all other multi caliber rifles, VOERE chose to introduce a brand new (we could say almost virgin) caliber, the 408 CT. The basic principle is probably (since I did not become aware of the exact reason) that while the 408 is still a wild cartridge, which means it has not been standardized by NATO, it could be the real future caliber for any multi caliber sniper system. If we consider the difference between a 338 LM and a 408 CT, instead of considering the “slight” ballistic differences between a 308 Win and a 300 Win Mag, then everything will become clear. The 408 CT is a caliber that is intended to stand between 338 LM and 50 Cal but that, although it will never be a 50 Cal, can be still mounted and adapted to a singular chassis for multi caliber rifles. It provides that “something extra” to any future sniper that can be only be provided today with the use of a 50 Cal weapon. Furthermore, let us see how the rifle operates during shooting. I started testing the rifle chambered in 308 and the 66cm barrel with 12” normal twist. As I expected (since the Voere X3 has¼ MOA precision in all its calibers) the weapon was great. The optimal combination of the muzzle brakes and the overall setting of the weapons made me feel like I was using a surgical instrument. I started engaging a target positioned within a 200-300 Mt distance. From that point on I moved my point of aim for the positioned target to further distances up to an 800 Mt target hit, while only changing my preferred point of aim but never my dope. I have to admit that I did not expect to be able to see the trace from my scope, but I did. This was, and still is the proof to everyone of how stable the VOERE X3 is, chambered with 308. Another aspect that really impressed me was how easily any setting of the stock can be changed. Without having been instructed on how to move and modify the position of the various components of my stock, I was able to reach the best settings in just few seconds! After this first stage, we moved on to 338LM with 69cm barrel and its characteristic progressive twist 16-10”. With the exception of the different recoil, that in any case remains very low, the overall feeling was the same. I was able to see the trace through my scope again, and I confirmed all hits with my favorite sentence “point of aim point of impact”! In this case, as well as for the 408CT, I was very satisfied with the muzzle break of VOERE. All of the gas dissipated without ever compromising the ability of the spotter to accomplish his job. There was a difference with the 408CT and its 72 cm progressive twist (18-13”) barrel. Although, as expected, the recoil was now significant on my shoulder, the X3 still maintained a very stable position. This I have to admit that a different grip would have been better. In fact, as many other Snipers, I used to shoot without grabbing the grip with my thumb. The recoil of he weapon made me feel quite uncomfortable in this situation, and as a result, I had to modify my usual grip. During the test, I was also able to experience the switching caliber system. The entire operation can be easily done in less than a minute with the use of a torx. Basically, the operator has to remove the four action fastening torx screws (only half twist), replace the barrel with the new one and tighten the action fastening torx screw again. Then, he has to remove the bolt, with a small percussion to remove the bolt head-locking pin, replace it with the new bolt head and put the pin and subsequently the bolt back in position. Although the external tool could be the weak part of this process, the Voere representative told me that they are now studying a new system to integrate the tool in the weapon. The VOERE X3 impressed me for its features and well-designed system. The choice of the company to adapt a 408 CT caliber in this weapon led me to believe that X3 will surely be successful in the future. Considering one-fourth MOA precision as an error of the weapon could really be considered an exaggeration, at least from what I saw during our test. The weapon proves to be a very good and solid tool for any sniper. Furthermore, the high quality of all components and the low cost of the rifle will surely be successful in the selection process carried out by the Decision Maker during the purchasing process. I tradition, enjoy international acclaim and are still considered to be an insider’s tip. • Product innovation – be it the most rapid firing anti-terror rifle, AM 180, to this day, the development of the first rifle with laser sighting system way back in 1972, the series manufacturer of the first hunting rifle for ammunition having combustible cartridge sleeves or the take down system, in which the stock can be detached from the quick-change latch. • Production technology – Voere has the most modern machinery offering high speed machining in up to 10 axes. • Manpower – 90% of the workforce consists of qualified specialists, many of whom are at the managerial level today had been trained as apprentices in the fields of machinists, toolmakers and gunsmiths. It is not without reason that components for the high-tech, electrical systems and mechanical engineering industries.